Traverse City Tourism, the official destination marketing organization for Traverse Citty, has been named Best CVB in Michigan by readers of Michigan Meetings & Events magazine. 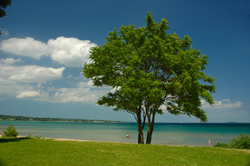 It might be easy to assume that the bureau has a no-brainer job – after all, Traverse City is breathtakingly beautiful and abounds in activities of all stripes. Traverse City Tourism announced this week that it has been named "Best CVB in Michigan" by Michigan Meetings + Events Magazine. Traverse City Tourism is the official destination marketing organization for the year-round resort community of Traverse City. Each year, the magazine’s readership of more than 20,000 convention and meetings industry professionals vote on their favorites in 21 different categories. Results were announced May 19 at the 11th Annual “Best of” Awards Dinner in Detroit. Also named best in their categories were seven other Traverse City entities: the Grand Traverse Resort & Spa (Best Hotel with Meeting Space/Over 200 Rooms, Best Golf Resort), Sarah Brown Photography (Best Photographer), the Cathedral Barn at Historic Barns Park (Best New Venue), Short's Brewing Company (Best Craft Brewery/Brewpub), Chateau Chantal Winery (Best Winery), Red Ginger (Best restaurant with Meeting Space), and Events North (Best Event Planner). In addition, twelve Traverse City entries were also runners-up in a number of categories: the Turtle Creek Casino & Resort (Best Casino), Floral Underground (Best Florist), Park Place Hotel (Best Hotel with Meeting/Event Space – Less Than 200 Guest Rooms), Corner Loft (Best Intimate Venue), Hagerty Conference Center (Best Meeting/Event Venue Outside Detroit Metro Area), Events North (Best Meeting Planning Company), Bonobo Winery (Best New Venue),The Franklin (Best Rooftop), Shanty Creek Resorts (Best Ski Resort), Celtic Shuttle & Tours (Best Transportation Company), Black Star Farms and Bowers Harbor Vineyard (Best Winery).